Sena lawmaker Sanjay Raut, in an editorial in 'Saamana', wonders whether the news of Atal Bihari Vajpayee was kept on hold on account of PM Modi's Independence Day speech. In its latest attack on ally BJP, the Shiv Sena raises questions around the announcement of former prime minister Atal Bihari Vajpayee's death on August 16. Sena lawmaker Sanjay Raut, in an editorial in the party's mouthpiece Saamana, wonders whether the news of the BJP stalwart's death was kept on hold on account of Prime Minister Narendra Modi's Independence Day speech on August 15. Mr Raut, a Rajya Sabha member who is also editor of Saamana, doesn't explain the reason for his doubts. Mr Vajpayee died at 93 after a long illness at the premier All India Institute of Medical Sciences, which also declared a time of death on August 16. "Rather than our people, our rulers should first understand what is 'swarajya' (self-rule). Vajpayee died on August 16, but from 12-13 August, his condition was deteriorating. 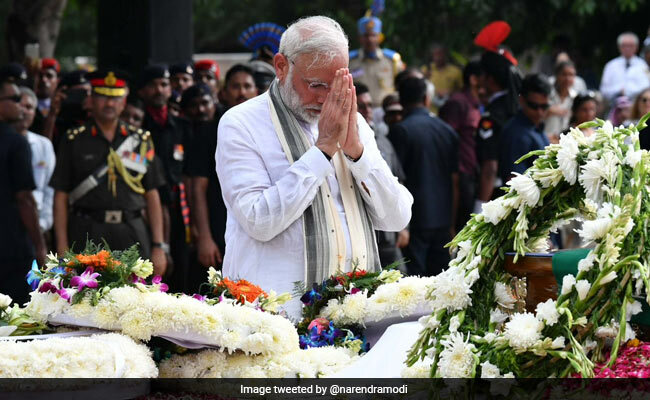 To avoid national mourning and lowering of flag to half-mast on Independence Day, and also (as) Prime Minister Narendra Modi was to make his elaborate speech from the Red Fort, Vajpayee left this world on August 16 (or his death was announced)," Mr Raut said in an article in Marathi titled "What is Swarajya?". Over the past few years, the Shiv Sena has not held back on targeting the BJP, its alliance partner at the Centre and in Maharashtra, and even announced that it will contest the 2019 national election on its own. In his article, Mr Raut accused the central government of "shielding" those who had heckled National Conference leader Farooq Abdullah in Srinagar for shouting "Bharat Mata Ki Jai" and "Jai Hind" at a condolence meeting for Vajpayee. "This new kind of freedom has now emerged," the Sena MP charged. He also scoffed at reports of terror plots in the run-up to Independence Day. "When it is learnt that police have captured terrorists who had planned to carry out attacks in Delhi, it tells you that Independence Day is nearing," Mr Raut said, also lashing out at PM Modi's foreign tours. "It is true that welfare schemes are run on the tax which honest people pay. It is also true that Prime Minister's foreign tours are funded by the same money, and thousands of crores are spent on advertisements from the same money. This is how the new 'Swarajya' is functioning," the Sena leader wrote.